What comes to mind when you hear the name Sherlock? If you said “intelligent” and “expert,” you’re describing us! As specialists in the development of innovative vehicle antitheft solutions, we’ve built an excellent reputation with our exclusive Intensive Antitheft Marking®. We’re also focused on the future, constantly seeking to forge new relationships with our customers and partners. Ensure automotive security by way of Sherlock’s proven marking process and team of highly qualified professionals.
" Remain the industry leader by providing the best possible antitheft protection. ". Over 900,000 vehicles now have Sherlock marking, making it the perfect time to reflect on our company’s success. Sherlock obtains European patents for its Intensive Antitheft Marking® concept and business methods, and applications for the same are pending in Canada and the U.S.
Sherlock commemorated its 30th year with an image makeover that complements our increasing visibility. 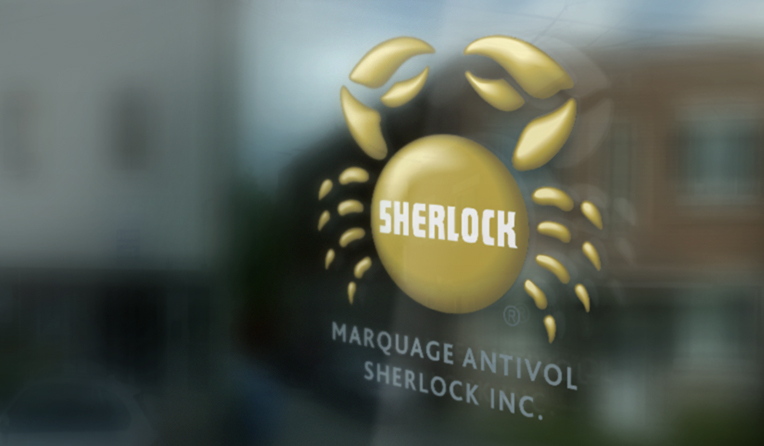 In our TV commercial, a would-be thief quickly decides to find a new target after finding the Sherlock golden crab on the vehicle he is about to steal. Founded in 1983, Sherlock Antitheft Marking today is the industry leader in the fight against auto theft in Quebec. Since it was founded, more than 1,000,000 vehicles have been marked, thanks to its distribution network of more than 600 services outlets. The company enjoys the support of the most reputable insurance companies and works in close collaboration with all of Quebec’s police forces. Sherlock is recommended by the APA (Automobile Protection Association) and is involved in the community via Info-Crime Montréal. © 2019. SHERLOCK ANTITHEFT MARKING INC. ALL RIGHTS RESERVED. ® Registered trademarks of Sherlock Antitheft Marking inc. Reproduction in part or in whole of this document is prohibited without the prior permission of Sherlock Antitheft Marking inc. Canadian and international patents. Other patents pending.